On this page you will find a selection of Deep Sea Technologies, which are operated by the marine research institutions involved in ROBEX and currently used in marine research. 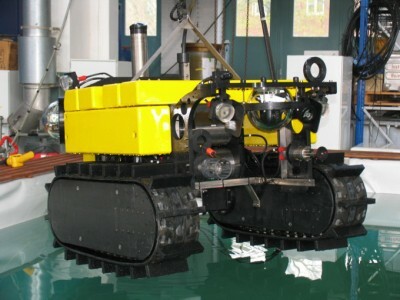 A Remotely Operated Vehicle (ROV) is a wire-controlled underwater vehicle for industrial, military and also scientific application. In the deep-sea, typical work-class ROVs are powerful heavy tools, slow in speed due to the high drag on the vehicle and tether cable, but are dedicated to work via video-control on site, with full control of movement along all axes. 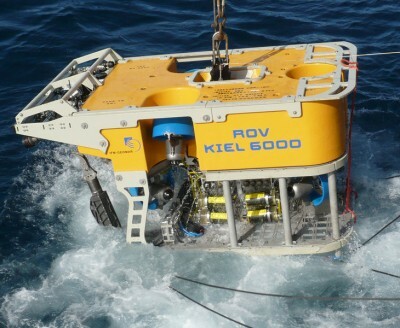 Due to electro/optic cable connection long mission duration is possible with ROVs. Between ROV and AUV vehicle classes the hybrid ROVs are placed. These are solely battery powered, but operation may be either fully autonomous or remotely controlled via an ultra-thin fibre-optic tether (< 200μ diameter). Autonomous Underwater Vehicles (AUVs), which are available for scientific, commercial or military purposes, are unmanned mobile underwater vehicles that perform pre-programmed missions. In contrast to ROVs, AUVs are untethered long-distance vehicles (50-100 km range) of higher speed capability (0.5 – 3.0 m/sec), but they are unable to stop on site, to hold depth or to hover within the water column. The independent mode of operation enable AUVs to work in oceanic regions that otherwise would be inaccessible or only accessible with unreasonable efforts. One of the most interesting approaches is the use of AUVs under ice. Therefore, it is of special importance that all system components of the underwater vehicle work properly, because there would be no chance to recover an AUV which gets in trouble under shelf ice of several hundred metres thickness. 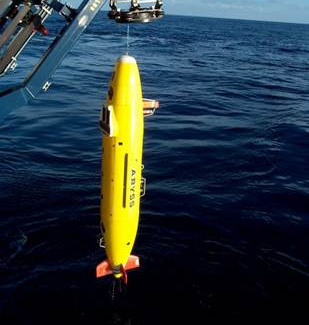 Depending on size and shape, an AUV can carry a variety of different sensors including sonar systems. Multibeam sonar data gathered with AUVs are generally good in quality because underwater vehicles are quite stable platforms with little roll and pitch, if compared to ships. Landers are autonomous instrument carrier systems that are used to study processes at the deep-sea sediment surface. They can reach the seafloor in a free-fall mode and are retrieved at the end of the mission by an acoustic command. However, many scientific objectives addressing specific geo-morphological features (e.g. cold seeps, gas-hydrates) require a targeted and soft lander deployment. For these requirements a special launching device has been developed connected to the ship’s coaxial or hybrid fibre optical cable that carries the telemetry, cameras, lights and a release to separate the lander from the launcher when the right location is found. Landers are universal instrument carriers with robotic functions for instrument placement and in situ experiments. 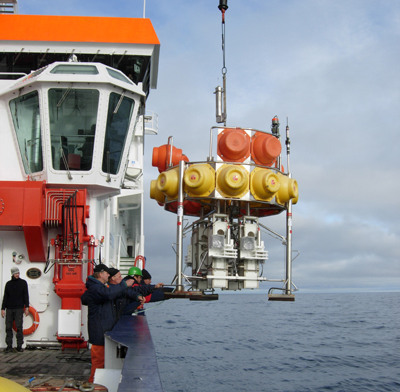 The sea floor observatory MoLab (Modular multidisciplinary seafloor observatory) is intended to measure different biological, physical, chemical and geological parameters covering an area of several square kilometres and time spans of several months. It was developed at the Helmholtz-Center of Ocean Research Kiel (GEOMAR) and constructed in cooperation with different companies based in Schleswig-Holstein. The system comprises a combination of different instruments which can be combined according to the respective scientific goals. 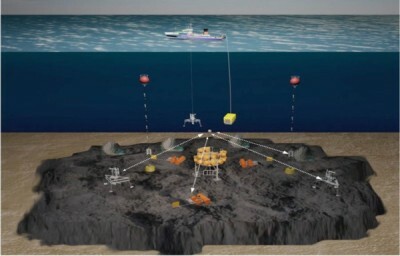 The great advantage of MoLab is that it may be deployed, maintained and recovered using medium sized research vessels. Furthermore, the system is flexible and may thus be moved to different working areas or adapted to different scientific tasks within short time. Thus, MoLab fills a decisive gap between projected, rather expensive and locally restricted cabled observatories on one hand and the commonly used ship-based short-term scientific measurements during sea-going expeditions on the other hand. The Deep Sea Crawler is a remotely controlled vehicle for use in deep sea areas. It is constructed as a universal device carrier for various ocean engineering sensors that can be operated via the internet from all over the world. 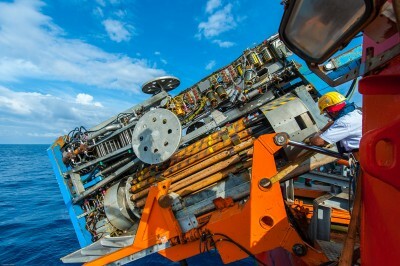 The Crawler is constructed for long term observations and long term measurements on the seafloor and for maintenance-free operation periods of up to one year. To avoid damages by the sea water the Crawler is completely made of titanium and plastic. Depending on the version the Crawler can be used in operational depths of 2000, 4000 or 6000 meters. Because of its modular design it can easily be changed for different measurement setups or new tasks. Here you will find more information about the deep-sea crawler “Wally” and his mission within the Ocean Networks Canada Observatory (YouTube video Wally the Crawler). The Crawler ROBEX Design Team will focus on the development of various autonomous deep-sea crawler. The MeBo (from the German: Meeresboden-Bohrgerät) developed at MARUM is a portable drill rig that is lowered to the sea floor with a special steel-armoured cable manufactured, where it is remotely operated from the ship. It can operate at depths down to 2000 meters, and take cores up to 70 meters long in soft sediments or hard rocks.